Railways were originally uniquely identified with the material of their initial construction and now are technically identified by the characteristic contact of ?steel wheel on steel rail?. The phrase ?Railways need steel ? steel needs railways?, defines the relationship between steel industry and the railways. Presently railways rely on a wide variety of steels for its materials requirement. It is since steel meets the requirements of cost, weight, reliability, crashworthiness, maintainability and inspection required by the railways. Large varieties of steels are used by railways for its requirement for (i) rolling stock (locomotives, coaches, and wagons), (ii) rail tracks (permanent way), (ii) electric traction, and (iv) infrastructure. A wide variety of steels is needed by railways. These include flat products, structural products, bar and wire products, special products like rails, wheels and axles, tubular products and steels for reinforcement. Steels required by railways are in the form of castings, rolled products and fabricates products. The quality of steels needed by railways varies with the application. The quality of steels used are mild steel, other plain carbon steels, alloy steels, high strength steels, wear resistant steels, corrosion resistant steels, spring steels, electrical steels, and stainless steels etc. Further some steels need special processing to meet the specific requirements of railways. The requirement of various steels is getting updated on a continuous basis with the advancement of rail engineering. For this, railways and the steel industry work in close co-ordination with each other. The rail track is known as a stable structure. It ensures the transportation of trains through providing a dependable surface for their wheels. As to the development of rail track, it has a long history. The first rail track was made of wood and had continued for about 50 years. Later in order to reduce wear of the wooden rail tracks, iron straps were mostly added to the wooden rails. Then it was replaced by cast iron rails. Cast iron rails were used till the steel production by Bessemer converter became possible. And since then, steel has become the material which is used for rail tracks. Presently, steel rails are used which are rolled from steel blooms produced in a continuous casting machine. Over the years, the shape of rails has changed a lot. Since first rolled in 1831, the ?T? section has been the standard for the rails. 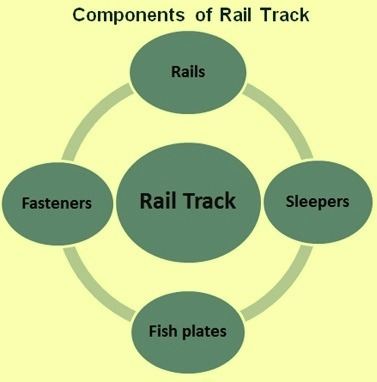 Rail track can be divided into main four components namely (i) rails, (ii) sleepers, (iii) fish plates, and (iv) rail fasteners (Fig 1). These components along with the steels needed for them are described below. Rails are the members of the track laid in two parallel lines to provide an unchanging, continuous, and level surface for the movement of trains. To be able to withstand stresses, they are made of high carbon steel (carbon -0.6 % to 0.8 %, manganese 0.8% to 1.3 %, silicon ? 0.1 % to 0.5 %, sulphur and phosphorus ? 0.03 % maximum each, and aluminum ? 0.015 % maximum). Some grades of steel contain chromium (Cr- 0.8 % to 1.2 %). Rails are also produced from special steels containing niobium (Nb- 0.04 % max.) or vanadium (V-0.2 % max.). Recently rails made from corrosion resistant steels have also been developed. Rail is the most expensive material in the track. Rail is the steel section that has been rolled into an inverted T shape. Rails vary in weight and shape. The rail section has a shape which looks like an inverted T and has a hardened head and a flat bottom. The flat bottom with an inverted T type cross section enables the rail to be fixed directly to the sleepers with the help of spikes. The flat bottom rail is also known as vignole rail. Another advantage of the flat bottom rail is that it is a more economical design, giving greater strength and lateral stability to the track. Rail sections are similar to steel girders. These are provided to perform the following functions in a track. Rails provide a continuous and level surface for the movement of trains. Rails provide a pathway which is smooth and has very little friction. The friction between the steel wheel and the steel rail is about one-fifth of the friction between the pneumatic tyre and a metalled road. Rails serve as a lateral guide for the wheels. Rails bear the stresses developed due to vertical loads transmitted to them through axles and wheels of rolling stock as well as due to braking and thermal forces. Rails carry out the function of transmitting the load to a large area of the formation through sleepers and the ballast. The main parts of a rail section are (i) head, (ii) web, (iii) foot, (iv) fishing angle, and (v) height of the rail. The requirements, as well as the main considerations, for the design of these rail parts are as follows. Head – The head of the rail needs to have adequate depth to allow for vertical wear. The rail head should also be sufficiently wide so that not only is a wider running surface available, but also the rail has the desired lateral stiffness. Web – The web is to be sufficiently thick so as to withstand the stresses arising due to the loads borne by it, after allowing for normal corrosion. Foot – The foot is to be of sufficient thickness in order to withstand vertical and horizontal forces after allowing for loss due to corrosion. The foot is to be wide enough for stability against overturning. The design of the foot is to be such that it can be economically and efficiently rolled. Fishing angles – Fishing angles must ensure proper transmission of loads from the rails to the fish plates. The fishing angles are to be such that the tightening of the plate does not produce any excessive stress on the web of the rail. Height of the rail – The height of the rail needs to be adequate so that the rail has sufficient vertical stiffness and strength as a beam. The rail should have the most economical section consistent with strength, stiffness, and durability. The centre of gravity of the rail section should preferably be very close to the mid-height of the rail so that the maximum tensile and compressive stresses are equal. There should be an economical and balanced distribution of metal in the different parts of the rail so that each of them can fulfill its requirements properly. The weight of rail is based on how much the rail weighs is in kilograms per metre. There are three classes of rails having ultimate tensile strength (UTS) of 880 N/sq mm, 1000 N/sq mm and 1080 N/sq mm. The most common rails which are in use have weight 52 kg/m and 60 kg/m. One more section which is in use has a weight of 45 kg/m. The weight of a rail and its section is decided after considerations such as (i) heaviest axle load, (ii) maximum permissible speed, (iii) depth of ballast cushion, (iv) type and spacing of sleepers, and (v) other miscellaneous factors. The length of the rail should be as long as it is feasible to produce and transport the rail. The longer the rail, the lesser the number of joints and fittings required and the lesser the cost of construction and maintenance. Longer rails are economical and provide smooth and comfortable rides. Rail is produced from fully killed steel and each section of the rail is to be accurately rolled to its respective template within permissible tolerance or variations. It is to be free from all detrimental defects such as cracks of all kinds, flaws, piping, and lack of metal that have an unfavourable effect on the behaviour of rails in service. It is also to be absolutely straight. Tolerances for end straightness are very stringent. The head hardened rails are with heads that have been hardened by passing them through a thermal treatment plant. The head is hardened for a depth of about 12 mm from the surface. Head hardened rails have a longer service life that extends up to 2 to 3 times more compared to as ordinary carbon-manganese rails. Rail sleepers are an important part of railway component. In general, it is also called railroad ties, railway ties or crossties. In order to keep the correct distance of gauge, the rail sleeper usually lays between the two rail tracks. For more than one hundred years, the rail ties have been developed to meet the various requirements of the different railway tracks. With the development of steel tracks, steel sleepers appeared and they are still being used. Later, between the line Nuremberg and Bamberg in Germany in 1906, the concrete sleepers were used. In the recent time, concrete sleepers are widely used in the rail tracks. Sleepers are the transverse ties that are laid to support the rails. They have an important role in the track as they transmit the wheel load from the rails to the ballast. Several types of sleepers are in use. They are typically made of one of four materials namely (i) timber, (ii) concrete, (iii) steel, and (iv) alternative materials (e.g. cast iron, plastic composite). The main functions of sleepers are as follows. Providing the means to rectify the track geometry during their service life. Wood and even steel sleepers provide resiliency and absorption of some impact through the sleeper itself. Concrete sleepers are the most commonly used sleepers these days. They are made from pre-tensioned pre-stressed concrete. They require pads between the rail bases and sleeper to provide a cushioning effect. High tensile steel in the form of plain wire or strand is used as reinforcement in the concrete sleepers. The design of the pre-stressed concrete sleepers is based on the maximum permissible compressive strength of 211 kg/sq cm and minimum cube crushing strength of 422 kg/sq cm at 28 days. Pre?stressed wires are stressed to initial stress of 8.82 kg/sq cm. The raw materials for concrete sleepers include high tensile steel stranded wire (HTS wire), high strength portland cement, spheroidal graphite cast iron inserts, graded stone chips (coarse aggregates), and river sand (fine aggregates). The dimensions are 2750 mm length, 150 mm top width, 250 mm bottom width and a height of 185 mm. Steel reinforcement is 18 numbers of 3×3 mm dia. Strands wire. The steel trough sleeper essentially consists of a rolled steel plate of about 2 mm thickness pressed into a suitable trough shape and the rail seat canted to 1 in 20. The ends of the rolled section are flattened out in the shape of a spade to retain the ballast. Two alternative types of steel sleepers have been designed for each rail section as per the following details. In one type, the lugs or jaws are pressed out of the plate itself to accommodate the foot of the rail and the key. There are several maintenance problems with these pressed up lugs, as they give way due to the movement of the keys as well as due to the vibrations and impact of the moving loads. In order to obviate this defect, another sleeper design has been adopted. In this design, two holes are punched into either side of the plate to accommodate specially designed ?loose jaws?. The rails are held with the help of two standard keys driven either into the pressed up lugs or into the loose jaws. The advantages of the steel sleepers are long life, (ii) easy to maintain gauge and less maintenance problems, (iii) good lateral rigidity, (iv) less damage during handling and transport, (v) recyclable after use, and (vi) not susceptible to fire hazards. The disadvantage of steel sleepers are (i) liable to corrode, (ii) unsuitable for track-circuited areas, (iii) liable to become centre-bound because of slopes at the two ends, (iv) develops cracks on rail seats during service, and (v) design is rail specific. Steel sleepers are mostly used in specialized locations or areas not favourable to the use of timber or concrete, such as tunnels with limited headway clearance. They have also been utilized in heavy curvature prone to gauge widening. However, they have not gained wide acceptance due to problems associated with shunting of signal current flow to ground. The important fittings and fasteners commonly used in rail tracks are (i) fish plates, combination fish plates, bolts, and nuts for joining to rails, (ii) dog spikes, fang bolts, screw spikes, and bearing plates for joining rail to wooden sleeper, (iii) loose jaws, keys, and liners for joining rail to steel trough sleepers, (iv) tie bars and cotters for joining rail to cast iron sleepers, and (v) steel elastic rail clips and spring steel clips for concrete, steel, and wooden sleepers fastening. The fish plate is an important connection between two rails. So if the quality of the fish plate is poor, the caused consequence is very big. The purposes of the rail joint (made up of two joint bars or more commonly called fish plates) are to hold the two ends of the rail in place and act as a bridge or girder between the rail ends. The fish plate is a steel bar that is bolted to the ends of two rails to join them together in a rail track. The top and bottom edges are tapered inwards so the device wedges itself between the top and bottom of the rail when it is bolted into place. The fish plates prevent lateral or vertical movement of the rail ends and permit the longitudinal movement of the rails for expanding or contracting. The joint is considered to be the weakest part of the track structure and should be eliminated wherever possible. Fish plates are made from plain carbon steel and are rolled steel sections. Typical composition for fish plate for fish plate is carbon – 0.30 % to 0.42 %, manganese – 0.6 % max., silicon – 0.15 % max., and sulphur and phosphorous – 0.06 % max each. The steel used for fish plates should have a minimum tensile strength of 550 N/sq mm to 650 N/sq m with a minimum elongation of 20 %. Fish plates are designed to have roughly the same strength as the rail section, and as such the section area of two fish plates connecting the rail ends is kept about the same as that of the rail section. As fish plates do not go as deep as the rail, the strength of a pair of fish plates is less than that of the rail section, about 55%, when only vertical bending is taken into consideration. Fish plates are so designed that the fishing angles at the top and bottom surface coincide with those of the rail section so as to allow perfect contact with the rail. The rail fasteners in rail tracks are provided to hold the rails in their proper position in order to ensure the smooth running of trains. These fasteners are used for joining rails together as well as fixing them to the sleepers, and they serve their purpose so well that the level, alignment, and gauge of the railway track are maintained within permissible limits even during the passage of trains. The purpose of providing rail fasteners is as follows. Among the components of railway track, the railroad fasteners are an important part. It can ensure the operation of rail transportation through connecting track rails with rail ties and rail sleepers. And it is also used to fix the correct position of tracks to prevent the horizontal and vertical displacement as well as the rollover. The good elasticity and insulating property also help rail fasteners do well in gauge adjusting. In the current time, there are various types of railway fasteners. For joining fish plate to the rails, fish bolts are always firstly chosen as the part of fastening. Fish bolt sets consist of fish bolt, flat washer and spring washer. And every two fish plates mostly need four or six sets of fish bolt. The primary purpose of a fastening is to fix the rail to the sleeper. The rail may be fixed either directly or indirectly with the help of fastenings. In the process, the fastening gets subjected to strong vertical, lateral, and longitudinal forces. The forces, which are predominantly dynamic, increase rapidly with increasing loads and speeds. In addition, vibrations are generated by moving loads mainly on account of the geometrical irregularities in the track and due to the forces set up by the imbalance in the rolling stock. The traditional rigid fastening, which has fulfilled its task to a certain extent, is no longer able to effectively meet the present challenge of heavy dynamic forces and, therefore, becomes loose under the impact of high frequency vibrations of the order of 800 to 1000 cycles per second, even at a moderate speed. This type of fastening is unable to hold the rail to the sleeper firmly for a satisfactory length of time because of the constant pressure exerted by moving loads. To overcome these problems a fastening which could safeguard track parameters and dampen the vibrations is required. This has led to the development of the elastic rail clip for fastening. Elastic rail clip fastener provides a constant toe load to the rail foot and is almost maintenance free. Elastic rail clip is made of a silico-manganese spring steel bar with a diameter of 20.6 mm and is heat treated. It exerts a toe load of 710 kg for a nominal deflection of 11.4 mm. Spring steel clip used for the fastening of rail with the sleepers is produced using EN-48 steel. The rail spike, with an offset head, is mostly used to secure rails and base plates to rail ties in the track. The main function of rail spike is to keep the correct position of gauge. In general, the attachment is made as strong as possible when attaching tie plates. Besides, there are many other components of railway tracks such as rail bolts, tie plates or rail anchors. They make up the whole railway system and play an important role in the operation of rail tracks. In a word, without any one of the components, the transportation cannot be in normal operation.